Every day of the year, guests of Emmanuel Dining Room are seated in a clean, cheerful dining room and served a nutritious meal in restaurant fashion. An average of 550 meals are served every day. All who come through its doors are warmly welcomed, and there are no questions asked. Emmanuel Dining Room helps alleviate the immediate needs of Delaware’s hungry with nutritious meals served at no cost. The program operates at three locations in economically depressed areas of Wilmington and New Castle, Delaware. 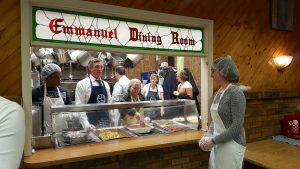 At the heart of Emmanuel Dining Room lies the faithful ongoing support of members of nearly 100 churches, synagogues, businesses, and civic groups who prepare and serve meals on a rotating basis. 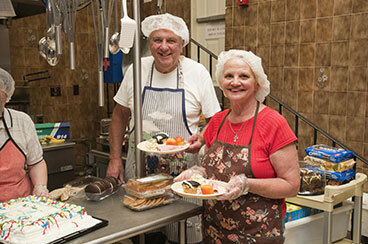 John and Jeannette Richart of St. Mark’s United Methodist Church help prepare a meal at Emmanuel Dining Room. Bring food donations to Emmanuel Dining Room West at 121 North Jackson Street between the hours of 7:30 AM and 2:30 PM, or call Program Manager ReeNee LaFate to arrange a delivery time. ReeNee can be reached at 302-652-3228. You may designate donations to the Ministry of Caring by contributing through United Way at your workplace. Nearly one-third of Emmanuel Dining Room’s operating budget is provided by United Way and Combined Federal Campaign of the Chesapeake Bay Area. On the pledge form, please use the EDR Direct Designation Number, 0295. To donate to EDR through the Combined Federal Campaign (Chesapeake Bay), select 63380. Throw a can-raiser! Create an event with an admission price of one canned good. Bring the proceeds to EDR West. 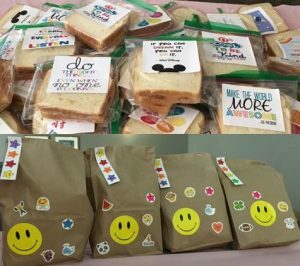 Make bagged lunches together with your company or organization. Try Cooking for a Cause — Team build with your group as you compete in challenges, cook food together, and give back to the community. Details can be found on their program’s website here. 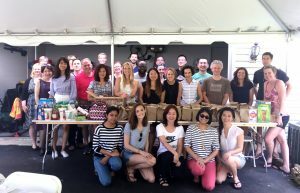 The Marketing team from Capital One in Newark, DE made PB&J bagged lunches and assembled no-bake lasagnas during their team building event.